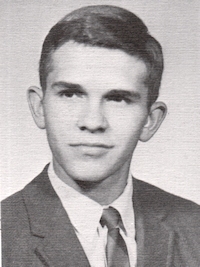 Obituary – Gould, Donald Dean « Perry High School Alumni Association, Inc.
﻿Wrestling 63-65, Thespians 65-67, Boys’ State 66, Student Council 66-67, F. T. A. 65-67, F. C. A. 65-67. ﻿Graveside rites will be at 10 a.m. Thursday at Grace Hill cemetery for Donald Dean Gould, 40, formerly of Perry, who died Saturday at his home at 1914 Wedgewood Court, Stillwater. Rev. William Powell will officiate. Arrangements will be under direction of Brown Funeral home of Perry. Born Oct. 17, 1949, at Perry, he was the son of the late Lorn and Sylvia Gould. Gould was a graduate of Perry high school. He was owner-operator of Perry Iron and Supply at Perry. He was a member of the Episcopalian church. An avid hot air balloonist, Gould was a member of the Balloon Federation of America. Survivors are one daughter, Shawna Gould, Albuquerque, N.M.; and a sister, Mrs. Curtis (Lorna) Cunningham, Oklahoma City.